Everyone needs a little attention now and then. Nothing over the top – just a smile of recognition or a pat on the pack – something to help you feel appreciated. But there are days when it seems that nobody has noticed you. 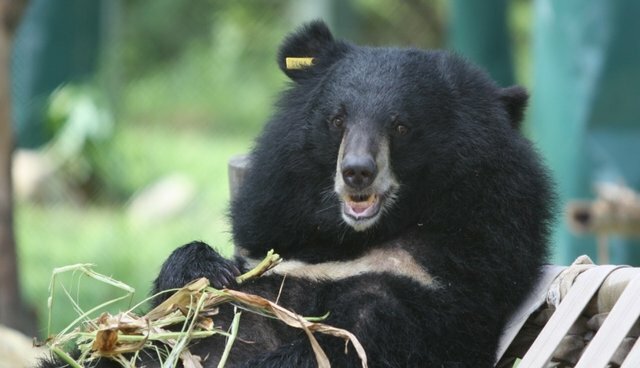 That's surely how fun-loving moon bear Lotus, who lives at Animals Asia's Vietnam Bear Rescue Center, felt recently. All she wanted to do was play, but her moon bear pal was in a world of her own, relaxing in a hammock and tucking into some tasty browse. But you have to respect how hard Lotus tried. She made a good show of pretending her nest is comfier than the hammock, plumping the straw and even pulling off a forward roll into the soft down. But her preoccupied friend didn't bat an eyelid. Clearly something more obvious is called for thinks Lotus. So she subtly trundles into her friend's field of vision suddenly throwing herself to the ground like a footballer looking for a penalty. "Oh my goodness! Who left that enormous tire there?" She looks up expectantly – but not one bear has acknowledged her actions. Her last ditch effort was to throw herself down in the deep grass and writhe in the sunlight. No response. She comes a bit closer, performs a forward roll, reveals a previously hidden piece of bamboo, places it in her hind paws and propels it into the air all in one fluid motion. The silence from the hammock is deafening. There's nothing left for it. Sheepishly, Lotus approaches the hammock and tries to jump in. Have a great #MoonBearMonday everyone! Moon bear Lotus is one of 500 moon and sun bears that Animals Asia has rescued from bear bile farms in China and Vietnam. Sadly, more than 12,000 bears remain on bear bile farms in the two countries, kept in horrifying conditions and regularly having their bile extracted for use in traditional medicine.